The thing with a complicated inside cannot be cleaned well though the cleaner might be used to clean the inside of the repair goods when the television and the oil fan heater are repaired in the consumer electronic shop. In this case, it is possible to clean it well by blowing off dust with the air compressor. In addition, a lot of usages are convenient things in the air compressor. What is the air compressor? The number of air tools that demonstrate the power of the electric tool losing has increased by using the power of compress air recently. It is an air compressor as for the machine that generates the compress air that becomes the origin of the power It is said (Air Compressor), and is composed of the part that compresses air and the part where air is saved in the tank. It is possible to use it even by the repair of the consumer electronic, DIY, and the tire exchange of cars by the demand for a domestic air compressor rising recently. Dust is blown off by using the air duster. Water is able not to be used when the air compressor is used to clean the indoor fan of the air conditioner and to handle it easily and easily though water is often used to clean the air conditioner recently. However, the device is necessary for processing dust. The bolt of the tire can be removed with an impact wrench, and it tighten. There is the one that the tightening torque can be adjusted, too. It is possible to nail it by handling Naylor. The carpenter is using it well. Because paints of a constant amount can be uniformly sprayed with a spray gun, finish can be very cleaned. It is possible to use it to paint the plastic model. It is possible to put some air in the car, the tractor, the floatage circle, and the bicycle by using the tire zipper etc. It is possible to use it for grinding, the rust drop, and the painting peel by putting up the Sand blaster. Because it doesn't go well when there is moisture in air, the air filter is put in the exit of the compressor. First of all, the principle of the piston type air compressor changes the rotation of the motor into the reciprocation with the crank and the piston. Next, air is saved by compressing air in the cylinder with the reciprocation and the valve of the piston in the pressure tank. The motor stops when the maximum pressure power in the pressure tank is about 0.8 generallyMPa, and it becomes this pressure. This pressure also has the one that it is possible to adjust it. Air is saved in this pressure tank, and it works with a variety of air tools. It is easy not to necessarily use the performance and the easiness of the air compressor to use because the performance is good. The performance becomes good the larger the ability of the performance is, the larger the tank is. The one that the decrease in pressure is few no matter how it uses it is that the performance is good in a word. It is inconvenient for the movement, and the one with a special power supply might become necessary if it is too large when becoming Now [tsuka] ..floatage.. [dan]. Moreover, when it is too small, pressure decreases at once and it doesn't become work. It can be said that the one of the size corresponding to the usage will be used easily. 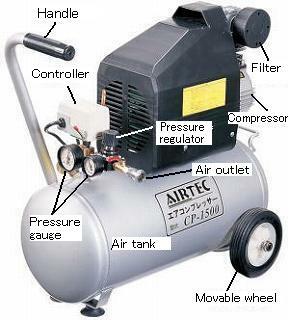 This photograph is air compressor CP-1500 of AIRTEC (Naka Tomi) that I am using. Because it is small, the performance is also hurried, and the wheel has adhered to the main feature of this model, it is possible to move by one hand. Moreover, the price is also handy. How to use of the air compressor. The air tools used are installed first beforehand about the pressure hose. Air leaks a little when this is installed when the air tool will be installed later. Please use the power supply of the compressor directly from the outlet as much as possible. Please defend the thickness and the length of the specified cord when extending it by using cord reel. Otherwise, it causes the compressor for the voltage to decrease and not to start. Let's use an air hose that is longer to extend the cord when working even if parting from the outlet. That goes well. The motor starts first when turning the power switch on and the compressor starts the compression driving. Air rises in the air tank waiting and the pressure gauge rise. Let's wait while air is being saved until pressure goes up without using the air tool. The motor stops automatically when becoming a specified pressure. The air tool can be used by this. The motor begins to work again when the scale of the pressure gauge falls on about 0.6MPa and air is saved. It can be adjusted that pressure steadies with the pressure regulator (regulator) when using it for the pump of the car and the bicycle. Moisture in air becomes a drop of water if it compresses air, and it collects in the air tank. Please open "Drain pulling out valve" under the tank to pull out moisture in the air tank after use. The tank might corrode if this is not done. It inhales into garbage on an atmospheric inside when using it in the place of in factory where a lot of dust exists and polluted air because the air compressor is inhaled air and compressed. Please check, and clean the dirt condition of "Inhalation filter" regularly (About once at half a year). The air compressor uses oil for the purpose of "Lubrication" of the equipment and "Cool". The oil change exchanges the level and the whole quantity once every six months. Oil must use the one for the compressor. The one small of recent has the product that doesn't use oil either.